Take a tour of Amish country without leaving home — with A Portrait of Amish Life. This full-color photographic display brilliantly captures the beauty of Amish Living. Pastor and photographer Richard Brunstetter’s photography is available — for the first time ever — in one stunning collection. 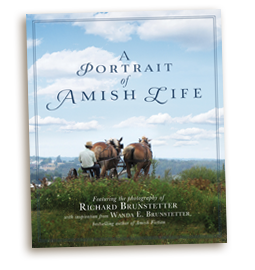 You’ll be fascinated with an up close view of the Amish and inspired by scripture selections and thoughts from Richard’s wife, Wanda E. Brunstetter, bestselling author of Amish fiction. 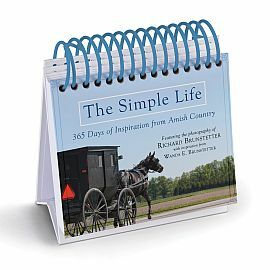 Start your day off right—every day of the year—with The Simple Life, and find yourself transported to the heart of Amish country with photography by Richard Brunstetter plus inspiration from New York Times bestselling author, Wanda E. Brunstetter. 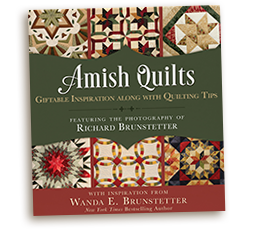 Since I have formed an attachment to Amish quilts, and my husband, Richard, has taken numerous photographs of beautiful Amish quilt patterns, it seemed only natural for us to collaborate on a lovely coffee table/gift book. The Amish Quilt features his pictures, and there is also plenty of information about quilting, as well as several inspirational quotes. Although I don’t have time to make any quilts, I do have several Amish quilts and quilted items in my home. Some of these are also included in the book. I hope those who purchase this special gift book will enjoy all the photos as much as I do.